Pub in Fitzrovia, and part of the Mitchells & Butlers Castle sub-chain. The Carpenters occupies a slender corner spot and retains its old Wenlock Brewery tiling. There are tables outside on the street (mostly along Whitfield Street, but with a couple of small tables on the Howland Street side). Inside, there are two rooms downstairs (the old saloon and public bars), but attractively redecorated, including a cute little corner decorated as a suburban 50s-style British living room. There's another room upstairs (the Belle Bar, which can be booked), which stretches around an upstairs bar, with period glass partitions, heavy velvet curtains and quite a few tables. At the end of the upstairs bar is a modest roof garden, with two large tables and a couple of smaller ones. There's a lattice for creeping plants to grow over the large tables, but it doesn't provide any effective cover from the elements should it be raining. The upstairs bar isn't usually opened until around 6pm on weekdays. 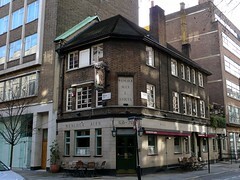 There are handpulls for ale on each of the three bars (two on one side downstairs, three on the other, and two more upstairs), offering London Pride, Sharp's Doom Bar and a guest downstairs (including scrumpy on occasion), with just the Doom Bar upstairs on an August 2009 and a September 2011 visit. They rotate guest ales, and had Adnam's Southwold Kölsch on an October 2009 visit. Draught lagers include Leffe, Erdinger (£1.75/half pint), Peroni, Früli on all bars, with Blue Moon, Beck's Vier and Red Stripe lagers and Gaymer and Aspall's ciders also available downstairs. Food is served from noon-10pm every day (except Sunday, until 9:30pm) and is from a standard Metro Professionals pub menu, so there are £5 daily lunchtime specials available. Ewan tried a grilled goat's cheese sandwich with roasted red pepper and rocket (£3.75), with chips on the side for an extra £1.25 photo. There weren't too many chips served with it, but the sandwich was filling enough for the price. Service was in any case friendly. It tends to get rather busy downstairs on most lunchtimes and especially loud and packed after work, but fewer people seem to find the upstairs seating, and Ewan was able to get a roof terrace seat on a Tuesday lunchtime visit. In general, the upstairs bar is a pleasanter environment if it's open, though the downstairs is hardly shabby. Last visited by Ewan and work colleagues, September 2011. Opening hours and food times taken from website, August 2009. Last edited 2013-06-06 12:34:45 (version 11; diff). List all versions. Page last edited 2013-06-06 12:34:45 (version 11).